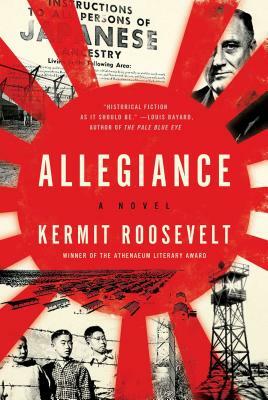 Allegiance, the historical fiction novel by Kermit Roosevelt, is a sophisticated legal thriller that plunges readers into the debate within the US government surrounding the imprisonment of thousands of innocent Americans during World War II. Roosevelt sat down with us to answer a few questions about his book, and parallels between his book and some of the rhetoric being spouted during this presidential race. 1. How did you come to write Allegiance? What I was thinking about in 2007 was the response to 9/11, and more particularly the Guantanamo detentions. I had just started working as a constitutional law consultant on a Guantanamo case, and I had visited the prison camp, and I had started to learn what the government was doing to keep me safe—what it was doing for my benefit, in my name. So I wanted to write something about what we do in times of national insecurity. And the reaction to Pearl Harbor and the detention of Japanese Americans seemed an obvious choice: there’s the shocking attack, striking us in a way we didn’t think was possible, there’s the President, saying he’ll do whatever is necessary to keep the nation safe, and there’s the Supreme Court, forced to decide how far the President can go. I thought that would be a great environment to explore, because it puts people to difficult moral choices. It makes them struggle to reconcile different commitments—their loyalty to their family, to people like themselves, to America, but also to more abstract ideas of justice and fairness. I thought it would be really interesting to create a character who’s living through this time, who wants to do the right thing, and comes to realize that what’s right can be a very complicated question. I could see going in that there would be parallels between the post 9/11 era and the reaction to Pearl Harbor. I wasn’t prepared, though, for how precise the parallels would be. Right now I’m reading an advance copy of a book called Al-Tounsi, which is about a fictitious Supreme Court deciding a case about the rights of enemy combatants. It’s very interesting because if I’d tried to write about the current Court and make up Justices, I probably would have written something similar. I’m also finishing The City of Mirrors, the conclusion of Justin Cronin’s vampire trilogy. 3. Do you have a personal favorite book of all time? If so, can you share it and tell us why? I’d probably have to say James Joyce’s Ulysses. It has so much in it that just about no matter what you’re looking for, you can find Joyce executing it flawlessly. 4. Allegiance is particularly relevant in light of the current presidential campaign with one candidate proposing a blanket ban on all people who subscribe to a certain religion. Are there any parallels that you would draw between internment camps and some of the ideas brought up during this campaign? People have actually talked about internment camps! That’s another way in which the parallels have been more striking than I expected going in. But more generally, the idea that some Americans aren’t real Americans, that they can’t be trusted because they resemble the enemy in terms of race or religion or some characteristic like that, and that therefore we need to be suspicious of them, that’s the biggest parallel. And it brings up a lot of the issues that I try to explore, maybe most significantly when it’s okay to sacrifice some people or deprive them of some rights to make the rest of us feel safer. That’s the question my protagonist confronts over and over again—both as he works through the historical plotline, which focuses on the Japanese American detention and the Supreme Court cases about it, and as he confronts a conspiracy that’s drawn more from my imagination. 5. Is there anything you are particularly looking forward to the publication of? I very much enjoyed Lev Grossman’s Magicians trilogy, so I was excited to hear that he’s got another book coming out. It’s called The Bright Sword and it’s about Arthurian England after the deaths of Arthur, Lancelot, and Galahad. And like a lot of us, I’m waiting for the next George R.R. Martin volume. 6. What's next? Any upcoming projects you can tell us about? Allegiance taught me that writing historical fiction is very difficult—I would do hours and hours of research just make sure I got someone’s shoes right. So I decided that the next book I wrote would be partly autobiographical—so that I would be very familiar with the world in which it took place—and part fantasy—so that I could invent without worrying about accuracy. So it’s going to be about a law professor with a young daughter, but also demons. Demons with a Biblical backstory…I think it’s going to be a lot of fun. Kermit Roosevelt III is a professor of constitutional law at the University of Pennsylvania Law School, the author of the critically acclaimed historical novel, Allegiance, and a former clerk for Supreme Court Justice David Souter. A frequent op-ed contributor, his work has been published in the New York Times, the Washington Times, Time Magazine, the Huffington Post, and The Hill, among many other outlets. He serves as a media expert, panelist, and public speaker on issues including constitutional law, conflict of laws, federal jurisdiction, national security, civil rights, the Supreme Court, U.S. presidential history, Japanese American internment, and writing. Born in Washington, DC, he attended Harvard University and Yale Law School, and is the great-great-grandson of President Theodore Roosevelt.